S. Andrea is about an hour’s drive from the port of Portoferraio. It is a unique place that deserves a visit and offers a great deal in terms of landscape surprise ». 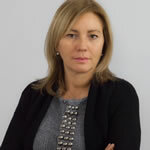 Says Loredana Zugno, owner of the publishing house Edizione Immagine, which publishes countless tourism editorials about the islands of the Tuscan Archipelago. And, continuing,: «The junction for S. Andrea is along the provincial road that connects Marciana to Zanca, here a steep descent leads quickly to sea level. As you arrive you encounter a seaside village, made up of small houses along the slope of the valley; continuing, the enchanting beach and bay of S. Andrea lie before you, a totally unexpected succession of cliffs that plunge one after the other into the crystal clear waters with an abundance of fish. The transparency of the water and the smooth rocks make S.Andrea a magical place, a real location loved by photography enthusiasts. 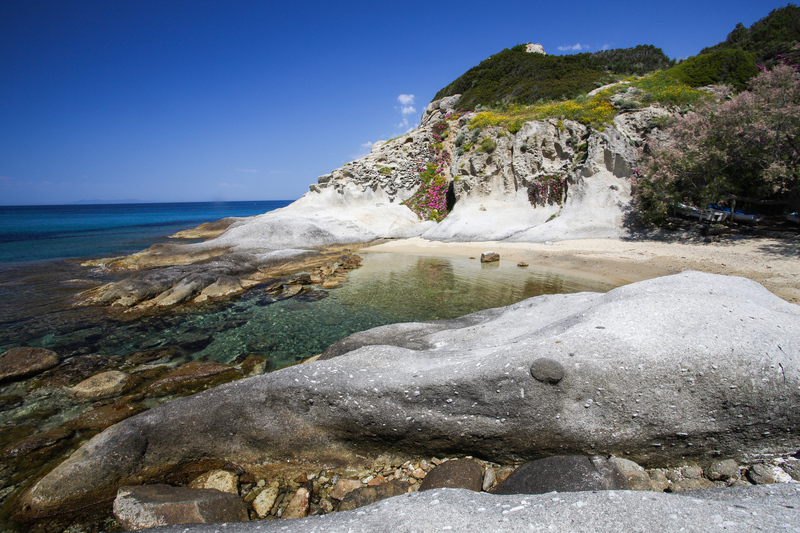 The Bay of Sant’Andrea is a small naturalistic oasis that surprises all who visit, mainly for the typical rock formations carved by time into structures that are in places welcoming and in others playful. 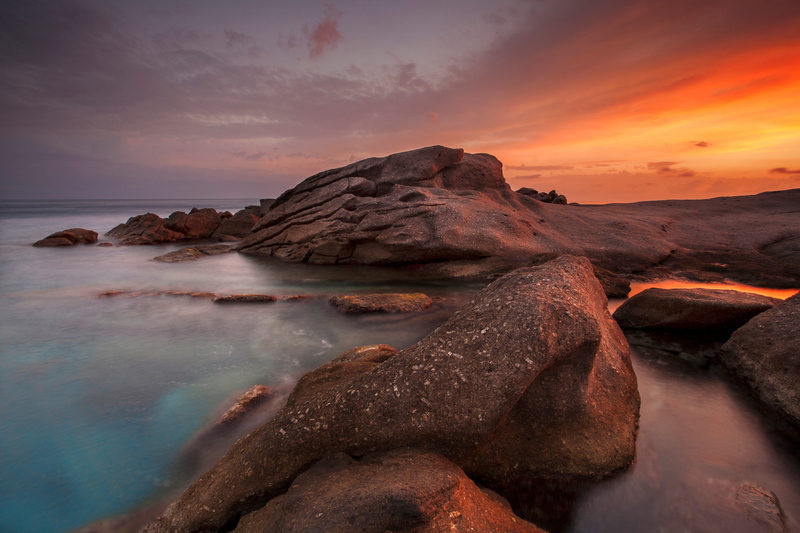 Have fun photographing the bizarre granite outcrops and then relax on the flat stretches or the nearby beach of S. Andrea, which is quite large and offers a variety of services and a beach establishment. If you plan your stay early enough, perhaps you’ll secure a booking for the SeaSuite, the most coveted in the bay of St. Andrea, just 5 meters from the beach. From S. Andrea beach you can continue both east and westwards. 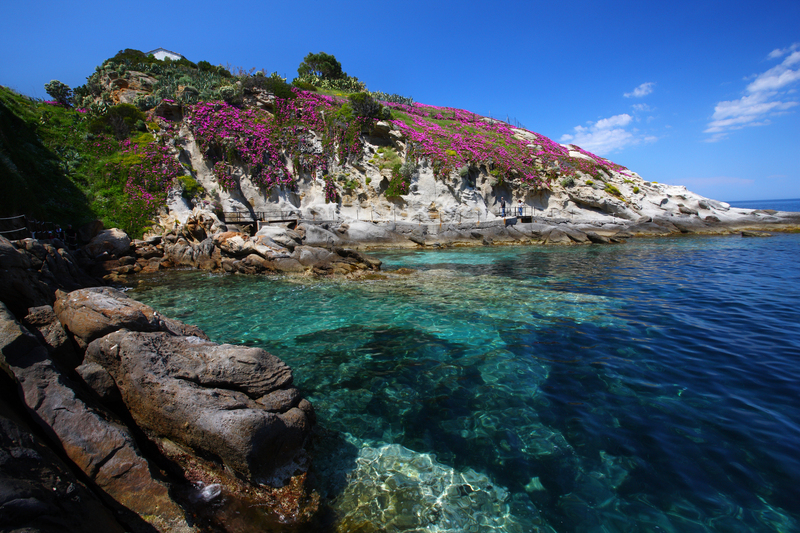 Walking east you can take a lovely path that runs by the sea and leads to Cotoncello beach and the small enchanted bay, Caletta del Cotoncello, surrounded by polished rocks and crowned by a group of tamarisks with foamy foliage. 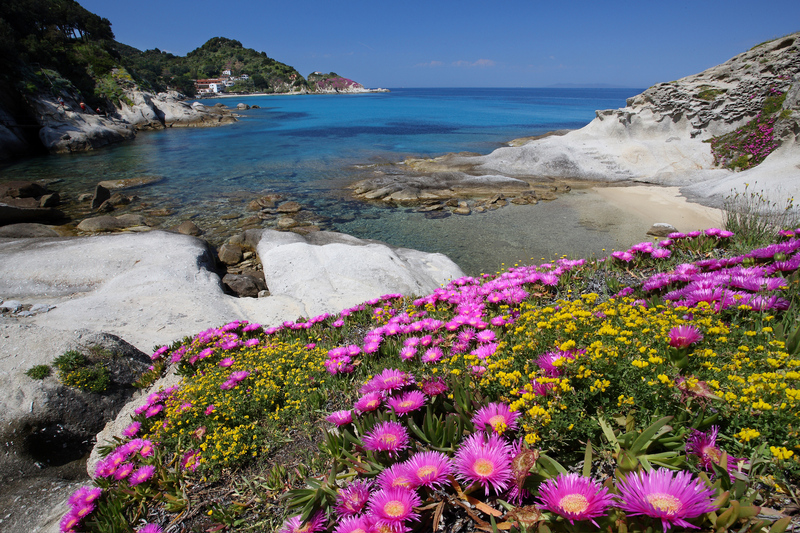 Above Cotoncello stands a wonderful panoramic promontory, where a path leads walking lovers to Marciana Marina; enjoy a walk in the spring amid shy daisies in bloom and with wide views over the sea. A branch off this path, between S. Andrea and the Cotoncello Bay, leads to the delightful Boutique Hotel Ilio, where you can enjoy relaxation and nature in a welcoming and stylish setting. To the west of the beach of S. Andrea towards Capo S.Andrea, the promontory that plunges into the sea looks, according to locals, like a dragon diving into the water. The path winds on a gentle slopes of granite and takes the name of Coti Piane. Here, especially out of season, you’ll feel isolated from the rest of the bay as you walk on the large bizarrely shaped rocks, reminiscent of the leg of an animal that seems to disappear into the blue waters. The cliffs from east to west of the Bay of S.Andrea are enchanting, regenerating, full of details and creative inspiration, and, as the nature of these landscapes enhances relaxation and meditation, at dawn or dusk you’re quite likely to encounter people engaged in photography, fishing or yoga. 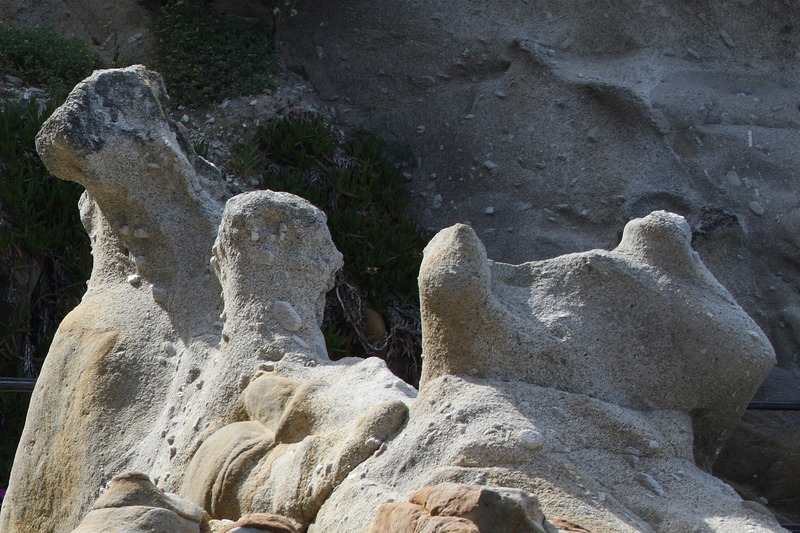 The extraordinary, enchanting rocks of S. Andrea are a wonder of nature to be admired at any time of the year, even in winter as they lie dormant and unperturbed by the stormy seas battering along the coast. The internal edge of the rocks, embraced by a thick cover of vegetation, is tinged with bright colours in spring, when the blooms are so lively and abundant that they seem to rush towards the sea, only to be held back by the long rocky curtain. Between the end of April and the beginning of May as you look at the promontory from afar, you’ll see clearly defined bands of colour: the pink of the Mesembryanthemum, the white of the cliffs and the blue of the sea. The sensation you have is that the flowering vegetation almost touches the waters». S. Andrea is a small naturalistic paradise and your ideal starting point is this Design Hotel, where you’ll find a Personal Elba Consultant to help you plan every detail of your holiday according to your interests. S.Andrea is the ideal destination for nature excursions on all levels! Climb up to the highest peak of the island, behind this beautiful bay, or swim into the depths, snorkelling or diving; in S. Andrea you’ll find qualified help and equipment and your Personal Elba Consultant will help you organize all the details». This is the perfect place for unforgettable moments. 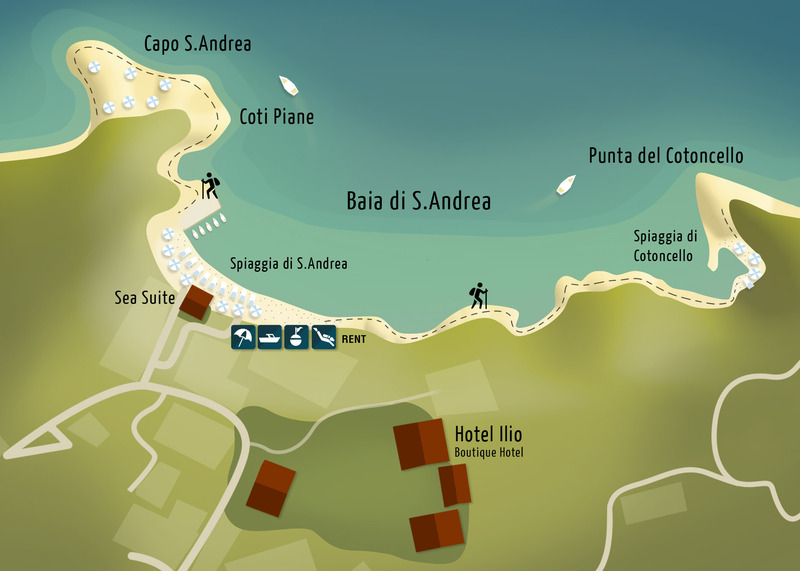 Book a romantic hotel right by the Bay of S.Andrea, such as the Boutique Hotel Ilio, where the hotel’s Personal Elba Consultant > is on hand to tailor make your stay.